When worked at Analysis Group, before I drank coffee, I used to listen wide-eyed to the VPs' tales of home coffee roasting. Steven Shurmann had just convinced AG to shell out for a fancy in-office espresso maker, with built-in water filters and surely more than the standard 15 bars of pump pressure, and he and Armando brought freshly roasted beans from their homes every Monday morning. Coffee roasting appealed more to my aesthetic sense of the good life than to my tastebuds. But then, that fateful night when I first started to study hard for the microeconomics general exam (a big test grad students take at the end of their first year) a few years ago, I decided to give coffee another try. Maybe it was several years worth of beer bitterness, or maybe it was simply my more advanced age, but that night, the free coffee at the Bureau (National Bureau of Economic Research, where I have a desk) actually tasted sort of good. It wasn't long before I ordered my own coffee roaster (I went with the economical Fresh Roast) and sample pack of green beans. 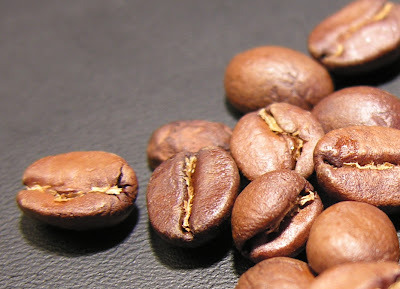 In this post I will describe the basic roasting process. When I do my cupping later this week or early next week (depending on when the beans arrive), I will talk about comparing different roast styles and different coffees. The beans arrive (from the ubiquitous sweetmarias.com) processed but unroasted. They are green and have a faint earthy smell totally unlike the smell of roasted coffee. Here, for example, is a picture of my new India Anohki beans ("a rare and intense coffee, odd blueberry sweetness and hidey, rustic chocolate, low acidity, bizarre!"). 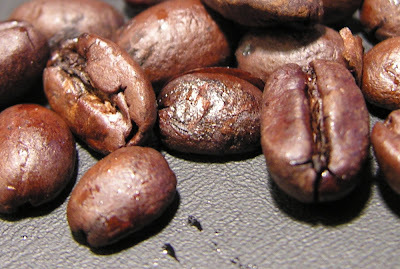 The unroasted beans can survive at room temperature for years. To roast, you throw the beans in the roaster, which is really just a glorified popcorn popper (with a special basket for the chaff - during roasting, the beans shed their outermost layer). They slowly turn a light brown, and you smell a popcorny smell. Then they start to crackle - the "first crack" is loud and assertive. After the second crack, there's a lot of smoke, and you're getting into French and Spanish Roast territory. If you get to the mythic and dreaded third crack, head to Peet's after desperately waving a towel under the smoke detector to ward off the fire department's expensive and probably unnecessary visit. 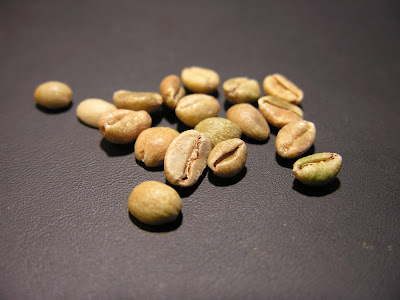 My sources vary on how long you should wait to drink the coffee after it's roasted, but it's certainly no more than on the third morning after roasting. I'm beginning to believe in the roast-10-minutes-before-you-drink model, which my new coffee roasting book attributes to the Italians. I can't resist anything the Italians do.